He’s a carpenter, theater and film director, and a driven man in the positive sense, a “maverick of Austrian cinema” (Alexander Horwath): Ludwig Wüst is among the most unusual figures in the local auteur film branch. His most recent film DEPARTURE (AUFBRUCH), which will open March 8, 2019 in local cinemas, celebrated its world premiere in the Forum of the Berlinale 2018, before its Austrian premiere at last year’s Diagonale. In a first-time cooperation with the Schauspielhaus Graz, the Diagonale’19 will now trace the diverse oeuvre of this veritable exceptional phenomenon Ludwig Wüst: Theater, Cinema, Wood – an In Reference tribute in three parts. 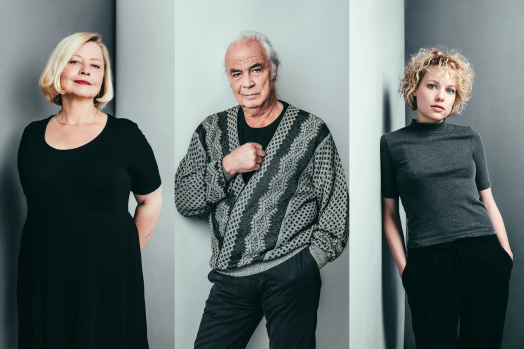 The festival of Austrian film will embark upon new territory in doing so, with an extensive cooperation with the Schauspielhaus Graz: On Thursday, March 21, 2019, Ludwig Wüst’s staging of August Strindberg’s Fräulein Julie will celebrate its premiere in HAUS EINS of the Schauspielhaus Graz. This evening at the theater features a prominent cast: Gerhard Balluch, shooting star Julia Franz Richter (a. o. L’ANIMALE by Katharina Mückstein, Trakehnerblut by Andreas Herzog and Christopher Schier), and Margarethe Tiesel (a. o. Paradies: Liebe by Ulrich Seidl, Das ewige Leben by Wolfgang Murnberger). With these last two cited, central roles are taken on by two actresses who could recently be seen not only in highly acclaimed stage productions, but also in films by directing greats such as Ulrich Seidl and Katharina Mückstein. Presales for the exclusive premiere of Fräulein Julie in the staging by Ludwig Wüst in the context of the Diagonale started on January 15! The Diagonale’19 tribute Theater, Cinema, Wood is framed and completed by a lecture on wood for fans and filmmakers. Like in Wüst’s films, layer after layer is removed to expose the hidden, beautiful, and obscure. A special program for all the senses! The tribute receives a further extension to its program with the presentation of the art book “HOLZ, THEATER, FILM – Die Arbeiten von Ludwig Wüst,” published by Album Verlag, for which the editor, initiator, and designer Claudia Siefen-Leitich gathered together manifold sketches, texts, and photos from Wüst’s private archive. The presales began on January 15, 2019. Discounted tickets can be purchased with a Diagonale accreditation. More on this here and here. Fräulein Julie, the young daughter of the earl, attempts to assert herself as an emancipated woman, in opposition to the reigning Zeitgeist. With the house servant Jean, who is already in a liaison with the cook Kristin, she embarks upon a disastrous night in which gender roles are suddenly reversed. From the seductress to the fallen one – Julie is driven into the cliché victim role, from which the only known escape is a tragic one. Ludwig Wüst stages the chamber play by August Strindberg as a new experimental arrangement, as a “vampire game” as he calls it: As a revived spirit, the young Julie haunts the elderly couple Kristin and Jean. Every year on midsummer’s eve, the dead who live in an old wooden coffin in the attic of the former manor, awaken from their deep slumber to live out their tales of passion, again and again. With My Father’s House, Wüst solidifies his international reputation as an uncompromising and exceptional filmmaker. Filmed with a hand camera in a nearly single take, a return home becomes a search for clues with an uncertain goal. Following the screening will be a Diagonale im Dialog talk with Stefan Grissemann. A carefully staged masterpiece, a film about looking at one another and being human. Special screening on festival Sunday, on the occasion of the opening in the cinemas on March 8, 2019. An international short film program curated by Ludwig Wüst offers insight into the creative work of filmmakers whom Wüst appreciates and admires. In this, focus is decidedly on cinema beyond the mainstream. Ludwig Wüst as movie buff, as cinema goer, as fan. The films by Ludwig Wüst, who learned the carpentry trade more than thirty years ago, always tell in passing of his love for wood and the work with this eminently sensual material. Wüst’s belief in the magnificent creative possibilities is also reflected in his works in wood. The lecture invites interested persons to contemplate a craft that will likely soon disappear. Information on registering for the event will follow closer to the time of the festival. Born in Bavaria, has lived in Vienna since 1987. He studied acting and singing at the University of Music and Performing Arts. 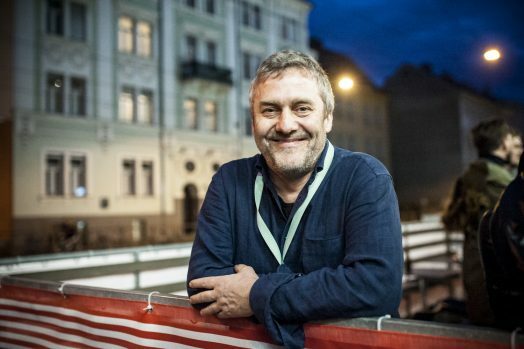 Since 1990, he has worked as director, author, and actor and has created more than forty productions for theater and opera in Vienna, Leipzig, Berlin, Munich, and Frankfurt. He has been a filmmaker since 1999. The Diagonale’19 will take place from March 19 to 24 in Graz. The entire program will be published on March 7. Ticket sales begin on March 13, 2019.